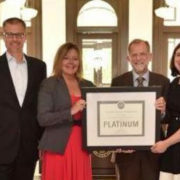 “TowerPinkster is proud to have lead efforts in helping Western Michigan University’s Heritage Hall Alumni Center achieve LEED Platinum Certification. LEED® – Leadership in Environmental and Energy Design – is the nation’s most widely used green building classification and platinum is the highest ranking. This achievement makes Heritage Hall the first LEED® Platinum building in the Kalamazoo area. Western Michigan University (WMU) was founded in 1903 and built its historic home, East Campus, on Prospect Hill overlooking the City of Kalamazoo. The site is home to the historic East Hall which was the birthplace of the University. Over 100 years of changing its use, the building had become obscured and obsolete, which rendered it to a “moth ball” state for several years. East Hall was reimagined as the new Heritage Hall Alumni Center, intended to become the most sustainable building on campus. The building underwent a programmatic change in use from administration and classroom functions to an Alumni Center. The design strategy entailed a blend of selective demolition, restoration, and additions. Removing asymmetrical additions from the 1940’s allowed for new egress stairs and a new single-story entry vestibule, as well as restrooms, and an elevator. New, open public spaces feature a library and café area to allow visitors to reminisce and connect with the campus, while corridors are lined with displays, artifacts, and historic elements. Classrooms were converted to alumni offices, meeting rooms, and a banquet room on the upper level. A primary goal for WMU was to make the new Alumni Center the most efficient building on campus. To do so, the team employed strategies from ASHRAE’s (American Society of Heating, Refrigerating and Air-Conditioning Engineering) Advanced Energy Design Guide for Small to Medium Office Buildings: Achieving 50% Energy Savings Toward a Net Zero Energy Building. The heart of the building is a geothermal system that generates both heating water and chilled water. The direct digital control (DDC) system manages the load generation versus the required load and automatically adjusts the heating and cooling loop temperatures to match the building load. Other innovations include restoring original light fixtures and converting them to LED. This allowed the team to keep the historic aesthetic while improving energy efficiency. Now, all lights at Heritage Hall are LED and feature occupancy sensor, dimming, and daylighting control. These strategies resulted in a 60% reduction in lighting energy over traditional systems. Efficient Operation and Maintenance were key throughout the design and construction process. To aid in maintenance, the entire building was designed utilizing BIM, level 500. This allows the facility staff to see exactly where equipment is within the building, as well as immediately access key data. To simplify maintenance, above ceiling equipment was minimized as much as possible. The majority of the equipment is located in the lower level mechanical room, or the penthouse, allowing for easy access. As a result of the energy design innovation, Heritage Hall operates at a 50% reduction over the LEED® energy model estimate and more than an 80% reduction over the ASHRAE standard: this means that the building is operating on less energy now, than when it was sitting in a nearly vacant “moth ball” state. Innovative design decisions were not only able to reduce energy costs, but also made the project eligible for utility rebates and tax deductions. The University realized $54,202 in utility rebates and $1.80/sf from the EPAct tax deduction to help offset the $24,000,000 construction cost. In addition to being the first LEED® Platinum building in the Kalamazoo area, Heritage Hall is also the fourth LEED® Platinum (Higher Education) building in Michigan. The project also received the 2016 Governor’s Energy Award for Michigan in the public building category. TowerPinkster has completed two other LEED® Platinum projects, including their own Grand Rapids office. The firm has additionally completed nine LEED® Gold projects, seven LEED® Silver projects, two LEED®-certified projects and eight LEED®-registered projects. The Grand Rapids Area Community Sustainability Partnership is a diverse network of for-profit and nonprofit organizations in West Michigan who embrace and support sustainability in their planning and operations and are striving to make a positive impact in our community. Ready to change the way you run your organization? © 2019 Grand Rapids Community Sustainability Partnership Designed by Well Design Studio.